Tools and media for construction of levels using Tomb Raider Level Editor. The following information and downloadable media refers to an exclusive release by tombraiderchronicles.com for Tomb Raider Custom Level Editor users, specifically the inclusion of a movable block into all WAD files, an object previously absent from Core Designs Level Editor application. 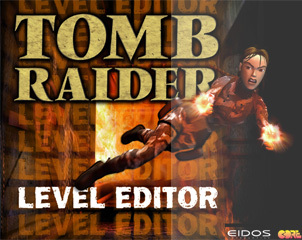 While the release of the Tomb Raider level editor marked a new era in the continued development of Tomb Raider, the movable block which featured in many official Core Design levels was omitted. This object has now been painstakingly created and inserted into all WADS released with the custom level editor and are now available to download exclusively from tombraiderchronicles.com Level designers are invited to download exclusive movable block tutorials which concisely show how the object can be placed into any level, as well as all associated media. Demo.zip - Contains a "tut1.tr4" file that you can place in your trle\data folder (after temporarily renaming the existing file to preserve it) and then play the Tutorial level with a set of movable blocks that will allow access to a hidden room inside the "Playable Tutorial Level." In the beginning of the level, after you pass through the first set of large double doors, bear to the right side of the column to where there's a movable block in the wall on your right. There's a series of 3 blocks to push before you reach the secret room. Exit the far end of this room and you'll find yourself in a different place in the Tutorial that you'll probably recognize right off. Tutorial.zip - A "must have" text tutorial that explains how to use the StrPix2 and TRwest programs to create new wads or how to use them to modify existing wads so that they will include the "Moving Block" object. Also contains some critical information that you won't want to miss. Starter.zip - A set of wad files that contain only the necessary objects to include Lara in a custom level. Use this as a starter and then use the TRwest program to add more objects. When you have all of the desired objects for your custom level, you can save this out as a new wad. You can still add or remove objects at any time. The Tutorial will go into greater detail on the uses of these wad files. BE SURE TO DOWNLOAD THIS FILE AS IT WILL ALSO BE USED IN UPCOMING TUTORIALS! Block.zip - A set of wad files identical to the "Starter" wad files above except these contain the "Movable Block" object. You will find a "PUSHABLE_OBJECT5" in the list of objects. This is the "Movable Block." Use these files to add the "Movable Block" to levels that you've already created. There is also a "Block.jpg" image that will be used in a section of the Tutorial that deals with changing the textures on the Movable Blocks. The Tutorial will go into greater detail on the uses of these wad files. BE SURE TO DOWNLOAD THIS FILE!